Skinner House is pleased to present a new edition of the Cambridge Platform, the 1648 document that first articulated the foundational principle of congregational polity. This independent form of church governance is the common heritage shared by Unitarians, Universalists and other congregationally ordered churches. 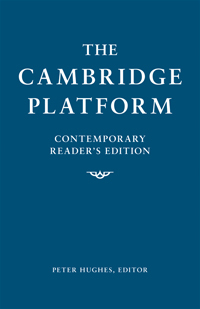 Now distinguished historian Peter Hughes has made the Cambridge Platform available and accessible to a new generation of ministers and laypeople, with clarified scriptural citations, modernized spelling and punctuation, and a preface that addresses the contemporary value of this touchstone of religious liberty. Alice Blair Wesley introduces modern readers to the small community of seventeenth-century New England immigrants who gathered at Harvard College to craft a religious declaration of independence. All believers ought, as God gives them opportunity thereunto, to endeavor to join themselves unto a particular church.... And should all believers neglect this duty of joining to all particular congregations, it might follow thereupon that Christ should have no visible, political churches upon earth. ...power of government in the elders does not any wise prejudice the power of privilege in the brotherhood, as neither the power of privilege in the brethren does prejudice the power of government in the elders; but they may sweetly agree together, as we may see in the example of the apostles, furnished with the greatest church power, who took in the concurrence and consent of the brethren in church administrations. The weakest measure of faith is to be accepted in those that desire to be admitted into the church, because weak Christians, if sincere, have the substance of that faith, repentance and holiness, which is required in church members, and such have most need of the ordinances for their confirmation and growth in grace. The Lord Jesus would not quench the smoking flax, nor break the bruised reed, but gather the tender lambs in his arms and carry them gently in his bosom. Although churches be distinct, and therefore may not be confounded one with another, and equal, and therefore have not dominion one over another, yet all the churches ought to preserve church communion one with another, because they all are united unto Christ, not only as a mystical, but as a political head; whence is derived a communion suitable thereunto. "This edition of the Cambridge Platform (1648) makes a crucial seventeenth-century document accessible to present-day readers. There is direct continuity from that normative statement of congregational polity by our forebears to our own theory and practice. It helps us understand ourselves and why we run our churches the way we do. It should be more widely familiar to both ministers and lay people."